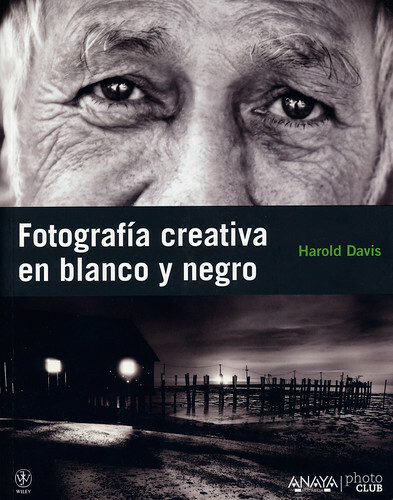 We are very pleased with the Spanish translations of Creative Black & White and Creative Portraits. 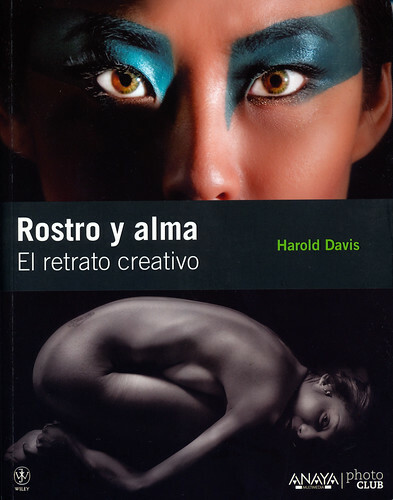 These Spanish translations are published and beautifully produced by Anaya. It rained heavily in the afternoon. I went out to shoot waterdrops in the garden at dusk after the rain had stopped. 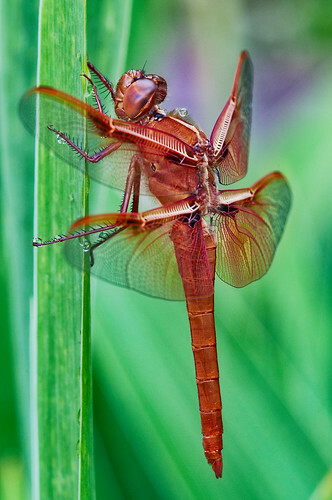 This dragonfly was sitting on an Iris, and I shot to my heart’s content! I used the 200mm f/4 Nikkor macro lens with a 36mm extension tube. I exposed manually at 1/5 of a second and f/14 at ISO 320. I boosted the ISO slightly (to 320) so I could use a shorter duration shutter speed, and chose my aperture (f/14) so that the dragonfly was sharp but the background was nicely out-of-focus, giving the illusion of more apparent sharpness than if I had stopped down all the way. Obviously, this is a tripod shot. 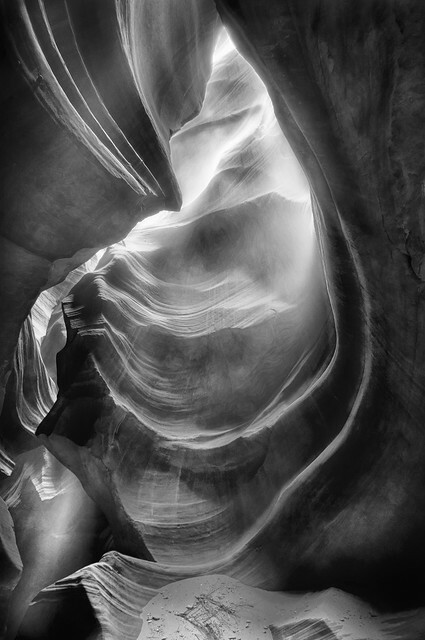 In Upper Antelope near Page, Arizona the sunbeams hit the slot canyon floor intermittently. Also intermittent, sand blew down in waves. The two conjoined in this 20 second exposure, with me wondering whether the risk to my camera from the scouring sand was worth the shot. 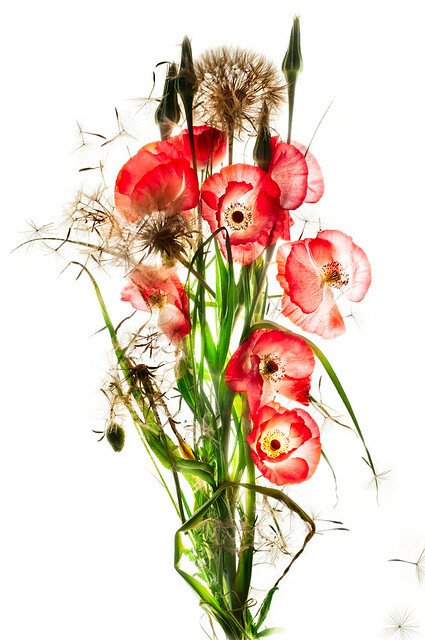 Some viewers of photography are impressed with the effort that goes into an image. 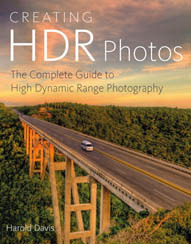 For example, the many steps that go into the photography and post-processing of an image like the one shown, or the all-night marathon of a Sunset to Sunrise star trail shot. But ultimately effort does not matter, any more than equipment does. I’m not saying that you shouldn’t master your craft as best you can. It also make sense to use good gear if you can get your hands on it. But effort and hardware are at most detours on the road. The true path is made from inspiration and those times—almost in spite of ourselves—that we capture something emblematic or a gesture in time. That’s what photography is about. For an art publication project I was recently asked to put some of my floral images with white backgrounds onto textured backgrounds. 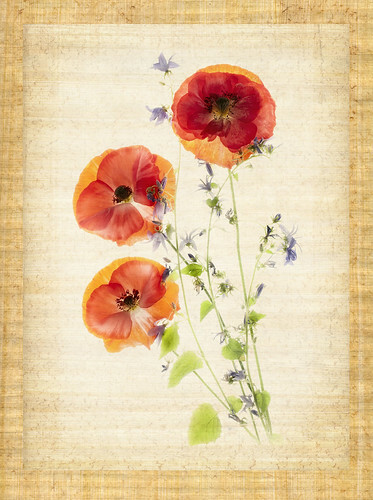 For example, here’s the original version of the Cherry Branch shown in this story, and one other converted image, Papaver and Campanula (original and on the textured background). My concept was to create a scroll effect, such as one might see in Chinese brush painting. To achieve this, I needed an almost white interior and a frame that had a highly textured appearance with sepia or yellowish tonality. The first stop was an art supply store to look through paper samples. I picked several pieces of papyrus for the outer frame, and some rice paper for the inside of the textured background. Phyllis scanned the paper for me using our desktop flatbed scanner. While the depth-of-field you get with a scanner is negligible, the resolution is very high—in this case 2400ppi for an 8.5X11 inch scan. So I had to size down the scans a bit when I started combining them to make my background. 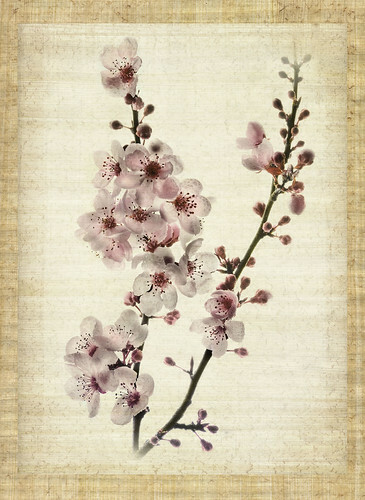 Once I had created the background in Photoshop—with a little rose color added to the “frame” for the Cherry Branch image—dropping the floral images onto the backgrounds as a layer was not a problem. Using Multiply blending mode meant that the white backgrounds in the original had no impact on the result—although I did have to play with taking the opacity of the floral layer down a bit (between 84% and 97% in the final version, depending on the image) so that the flowers weren’t too bright. 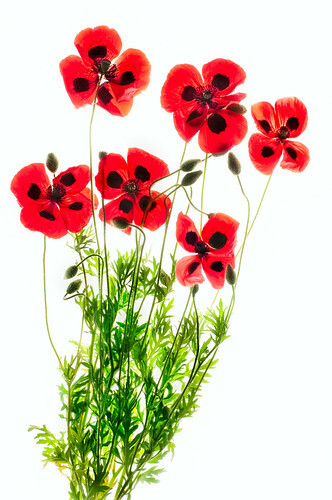 For a special project, I started with a high-key photo of poppies and bellflowers (Papaver and Campanula). I created the background by scanning and digitally combining two pieces of papyrus and a sheet of rice paper (Ohiri). I’d been searched around for some bright red Greek poppies to photograph, and over the weekend we went to Annie’s Annuals & Perennials in Richmond to see if we could find some. Annie’s is reclaimed from industrial wasteland and a great plant nursery for bringing the kids, with aisles and aisles of plants both rare and common, and push toys and vehicles for the young ones. Still, it was hard to concentrate on horticulture with my four loudly colliding into each other and hurtling this way and that. Alas, Poppy planting season has for the most part passed, and there were no Greek poppy plants to be had. Some of these wonderful red poppies were growing in a large pot, however. With permission kindly granted by Annie’s staff, I clipped them and then we quickly hurried home so I could photograph them on my light box. 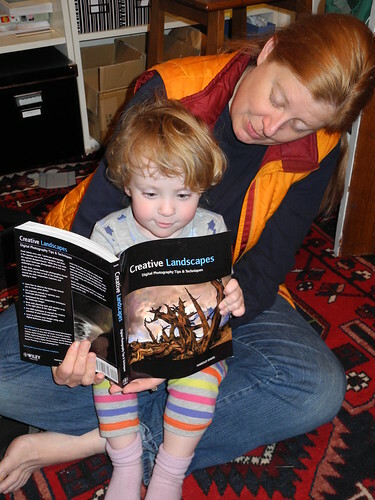 In a family tradition, Katie Rose checks out my new book Creative Landscapes: Digital Photography Tips & Techniques. The Gloriosa Lily is the national flower of Zimbabwe. It is also highly toxic. The poison in the flower is colcichine, in small doses used as a medicine for gout sufferers. But one of these flowers ground up and added to (let’s say) a communal fruit smoothy would be enough to kill everyone in a fair-sized village. With flowers as with femme fatales sometimes that which is most attractive is most dangerous. 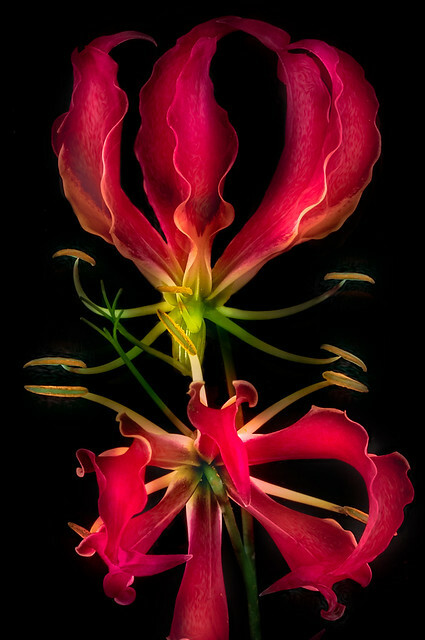 I photographed this Gloriosa Lily by placing it on a mirror. The setup used black velvet cloth wrapped around and above the mirror to create a solid black platform and background. If you follow my work, you probably have figured out that both this blog and my Flickr photostream reflect current projects. For example, if you see a great deal of landsape imagery, I am probably working on a landscape book. 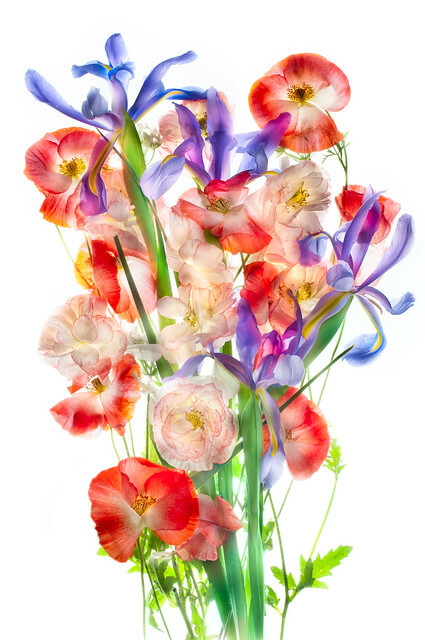 Floral imagery such as the one in this story, Papaver and Iridaceae, White Iris, Floral Impressionismo, and Floral Abundance are likely to suggest that I am working on a project involving flower photography—as indeed I am, with a beautiful and informative book about flowers and flower photography expected in time for Christmas. This is partly by way of blogger’s apology because I am having so much fun photographing flowers that my blogging time has eroded a bit lately. 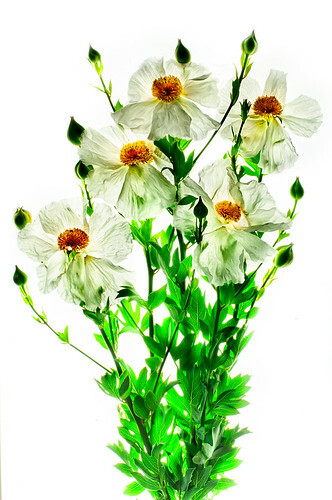 It’s fun developing new techniques for capturing flowers—an elusive, senuous and beautiful subject even when (as with the Matilija Poppies shown here) they are essentially growing wild on a strip between the sidewalk and a major thoroughfare. The Papaver Rhoeas in my garden called out for some complimentary colors, so I added some store-bought Iris. I photographed the combined composition straight down on my light box, using a macro lens from a distance and eight exposures. As usual with this kind of image, the exposures were biased to the high-key side, with the sequence starting at the darkest image (the correct exposure, according to my light meter). I needed some depth-of-field because the Irises had some depth, but not a great deal, so I selected f/11 for my aperture. At ISO 100, the exposure sequence went from 1/30 of a second to 4 seconds. Recombining these exposures was an issue of using layering and painting techniques in Photoshop. I started with my lightest layer, the one shot at 4 seconds, and where there was not enough detail I layered a darker exposure on top of it, painting it in very selectively. 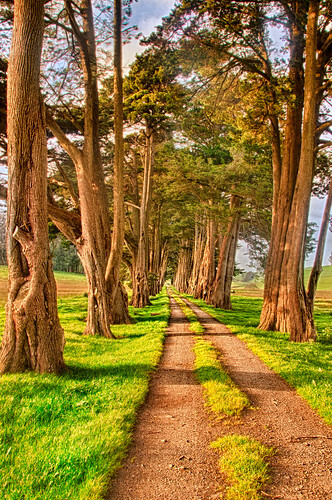 The paths we take in life are sometimes straight with the vanishing point clearly to be seen in the distance. Other times the path ahead is twisted and obscure. In photography, as in life, our job is to follow the path but not too precisely. One should always be open to the grace notes that lead to interesting tangents that are the true point. I photographed this country lane off Two-Rock Road in rural Sonoma County in the last golden light of a spring afternoon. Late one spring afternoon I was scouting the bucolic farm country of rural Sonoma County. 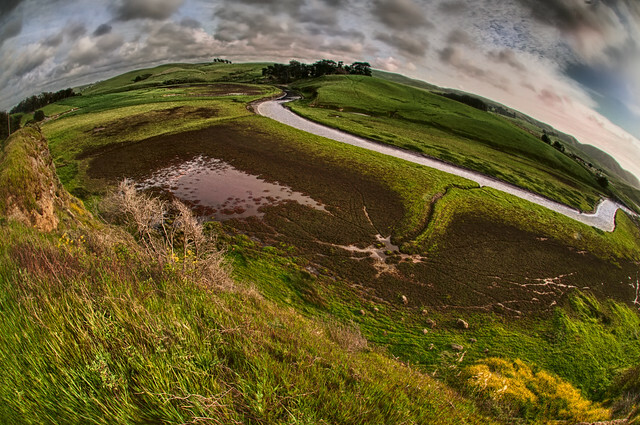 From Whitaker Bluff under scuttling clouds I photographed this cockeyed fisheye view of the bend in Siempre Creek and the curvature at the horizon. It’s unusual to shoot a landscape where the distortion is so obvious—because of the fisheye lens, and because I positioned the camera sideways at an angle—but I think in this case it works. 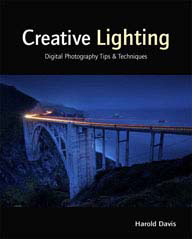 Speaking of landscapes, my new book Creative Landscapes: Digital Photography Tips & Techniques is now shipping from Amazon (although the official publication date of the book is still several weeks off). If you pick up a copy, please let me know what you think. 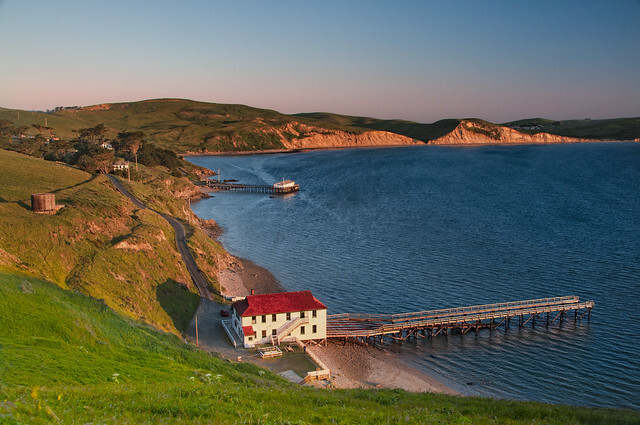 I set out for Chimney Rock in the dark before dawn, and turned back towards the Coastguard Boathouse in time for sunrise. From above, the scene was lit with a golden light. There was a stiff wind blowing, so I set my tripod up as close to the ground as possible for maximum stability. The foreground was still in deep shadow and the rising sun was lighting the cliffs of Drakes Bay with a strong and golden light. This situation cried out for HDR. I shot eight exposures, at shutter speeds between 1/2 a second and 1/60 of a second. All exposures were made at f/8 and ISO 200, with a 24mm focal length. In Photoshop, I first processed the set of images to combine them using the Nik HDR Efex Pro plugin. I wasn’t entirely happy with the results, so I proceeded to add detail to both the foreground and background by adding layers on top of the automated HDR version. Each of these layers was processed from the individual frames I had captured. If you look closely, you can see a workshop participant with camera and tripod on the near side of the Coastguard Boathouse. Related image: From Sunset to Sunrise. My darling Katie Rose is three. She’s shown in this snapshot at her three-year checkup; check out Prize Specimen, an earlier visit to the same pediatrician. Katie’s milestones remind us of how far she’s come from birth as 24-week preemie weighing less than six sticks of butter and resuscitated eleven times; check out The Day My Daughter Was Born and The Birth of Katie Rose for stories of her early days. She also has her own book that tells her story; you can find it on Amazon!